When dealing with your home, you want service you can rely on and trust. That’s why at Grand Rapids Stamped Concrete we’ve built an entire business around being the most reliable and trustworthy concrete company in all of Michigan. Finding a good concrete contractor shouldn’t be a difficult task. We want to make sure we are accessible to our community and that we make the entire process as smooth and enjoyable as possible. If you’d like to learn more about us visit our service pages or contact us today! You’ll be glad you did. Grand Rapids Stamped Concrete is a full-service Michigan concrete company that employs some of the best concrete contractors in the area. Our team is exceptionally skilled and knowledgeable about what they do. They will provide you with the guidance you need to make informed and smart decisions about your home and yard. They will also listen carefully and work with you to carry out your detailed design preferences. Our team is friendly, detail-oriented, hard working, skilled, and always practice good communication methods. We make sure that we are always on the same page before we begin any projects, and we check in throughout the process to let you know how things are going and to keep your mind at ease. When it comes to concrete, we offer a large variety of services to meet your every desire and need. From concrete repair to the installation of concrete patios, driveways, walkways and floors, we offer something for everyone and ensure that we cover all of our bases when it comes to your house and yard. Our team of cement contractors is the best and most skilled in the business. No job is too big or complex for them to handle. They will carry out the work with ease and leave you with a big smile on your face. Stamped concrete is versatile, giving you the highest number of design options to choose from. The pattern and color combinations are nearly endless and will look amazing just about anywhere. Stamped concrete is also cost-effective. It will last you a long-time without the need for repairs or replacement. Realistically you could have the same concrete patio or concrete driveway for decades, and it would still look as good as the day you had it installed. Driveways provide both function and aesthetic to your home, which is why stamped concrete is the perfect choice. 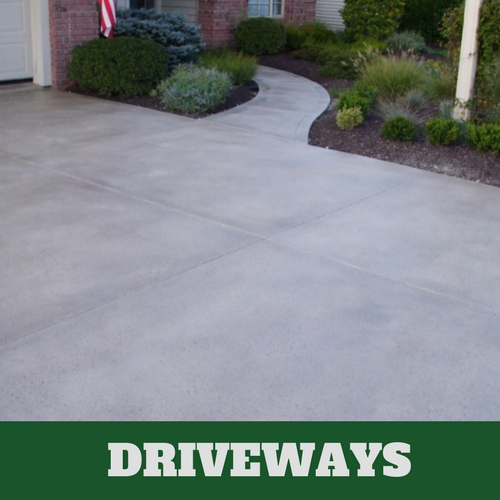 You need a driveway that is strong and built to last, just like concrete. But you also want a driveway that is aesthetically pleasing and will draw people’s eyes to your beautiful home. 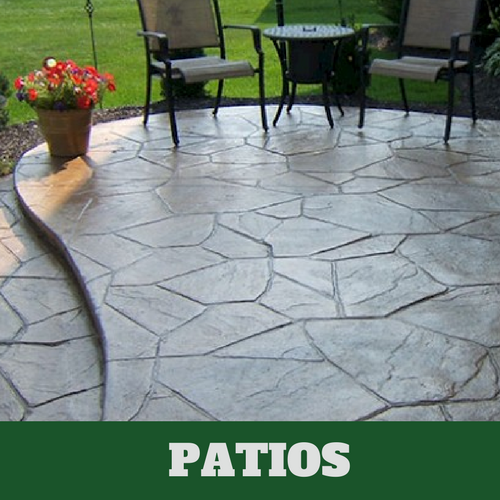 With stamped concrete you can have both – a material that is strong and durable and looks amazing time after time. 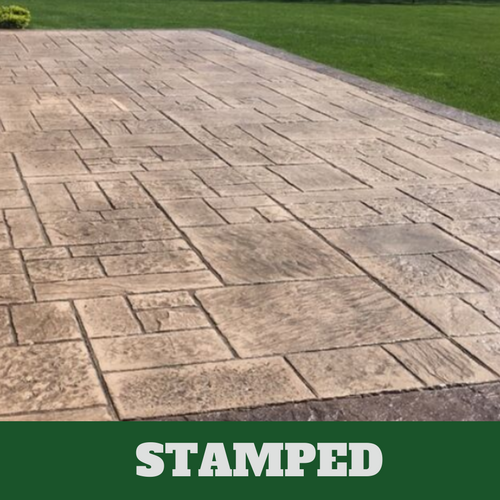 At Grand Rapids Stamped Concrete we specialize in just that – stamped concrete, which means that our patios are built with functionality, longevity and beauty in mind. Not only that, but our stamped concrete patio cost is fair and affordable, so that you don’t have to stress about finances in order to enjoy your home. 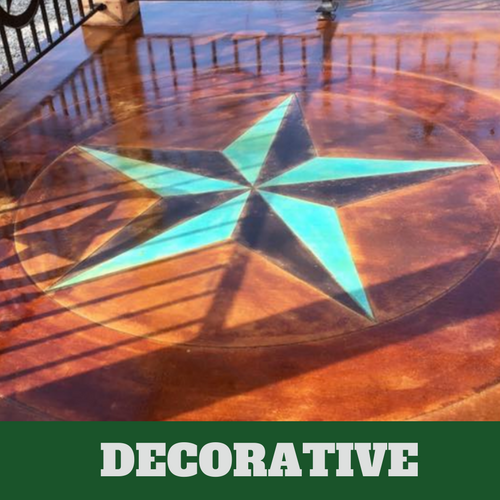 A stamped concrete patio is the perfect choice for those who love to spend time outside and have friends and family over for backyard barbeques. If you already have a pool or are considering installing one, then you know that designing the perfect pool deck is a large part of the process. Stamped concrete allows you to choose from a large number of color and patterns that look beautiful, but also provide maximum benefit. 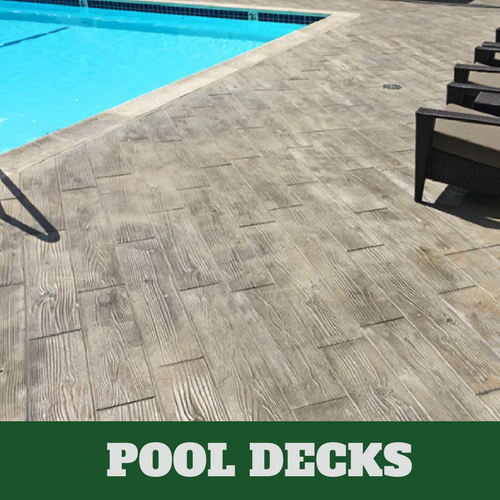 Your pool deck is the perfect location to play around with funkier designs that you might normally stay away from in your home interior or front yard. 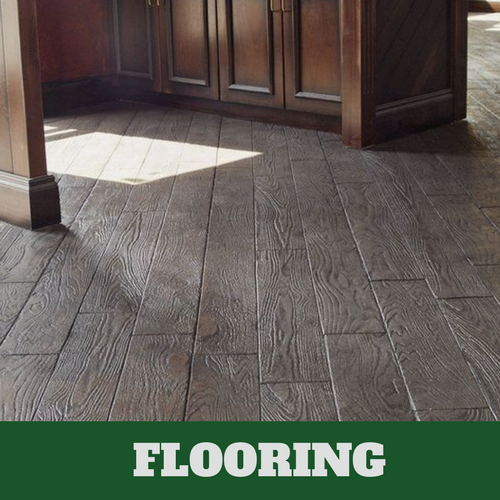 Choosing the right flooring for your home can be a tough and overwhelming decision. You want something that is comfortable and appealing, but also something that will hold up and be able to sustain a lot of foot traffic for years and years. Stamped concrete flooring has numerous benefits for homes and families. They are durable, easy to install, long lasting and extremely easy to care for. Concrete is known for being exceptionally practical. 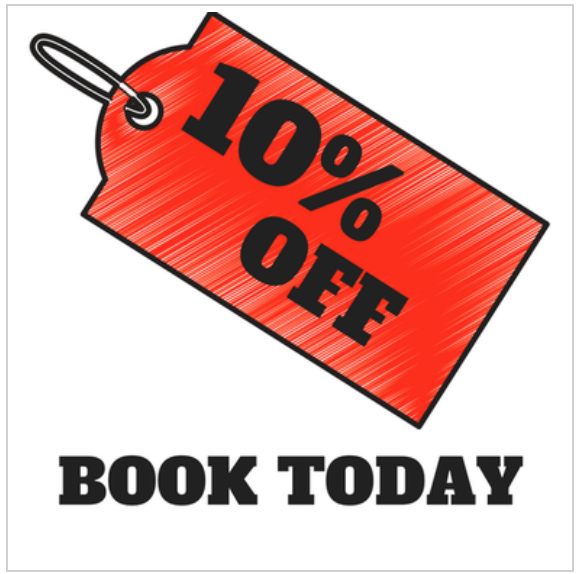 It is reliable and dependable and many opt for it because they know it to be a trusted material. Decorative concrete however, provides all that same practicality and functionality, with the stunning design options of more expensive and luxurious materials. It is the go-to choice for people who care about aesthetic and design just as much as they care about safety and structure. Ready to start your home renovation? Building a new home from scratch and need to make sure that everything is perfect? Have questions about an upcoming project and don’t know where to turn? Grand Rapids Stamped Concrete in Michigan will answer all of your questions and address your concerns so that you can rest easy. Dealing with concrete companies should not have to seem like a burden or difficult task. We will ensure that the process is smooth and that you enjoy working with us. Contact us today and let’s start building your dream home!